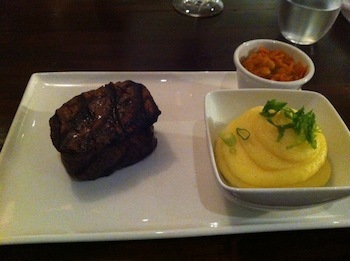 Hippo Creek is an unashamed bastion for the carnivore, serving up meat with South African flair. It’s located in the same complex off Hay Street in Subiaco as that other meatlover’s temple, Lapa, but that’s where the similarities end. People sometimes ask me which is better; my invariable response is how can you compare apples and oranges? Both are good at what they do, in their own way. Lapa is the place you go to indulge in a gluttonistic, meat-masticating frenzy on a very reasonable budget (significantly less than $100 a head, including wines). While you will certainly leave Hippo Creek with the swaying gorged belly of a lion who has just fed on a fresh savannah kill, it would have been from some of the best steaks I’ve ever come across, and you would have to budget at least $100-$150 a head depending on whether you do 2 or 3 courses and your choice of wine. Hippo Creek is not cheap, but you get what you pay for – top quality steaks, which you can see dry ageing on a hook in the display refrigerator as you walk in, and top quality weapons with which to feast on the steaks. 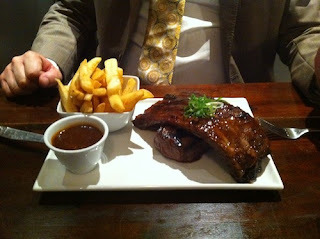 For the more gluttonous among us like my mate Simon (tie pictured), there is the ribs and steak combination. 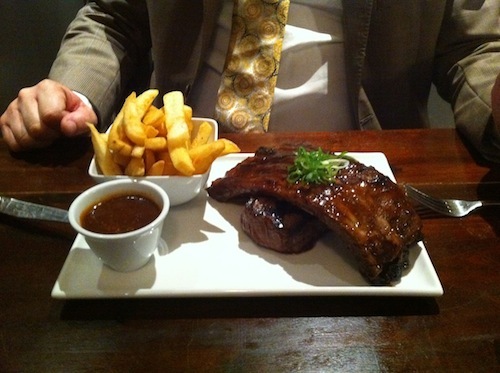 Beautifully glazed pork ribs resting on top of a big slab of fillet steak which would be a meal on its own. 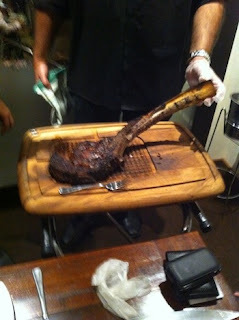 And not for the faint hearted is to wagyu tomahawk – best shared with friends unless you wanted to risk a hernia for trying to stuff 1.5-2kg of meat into your stomach in one sitting. From memory, it has a marbling factor of only 5 or 6, which in my view is just right for a steak of this stature. If you’ve ever tried to eat a conventional sized wagyu steak with a marbling factor of 8 or 9, you will know exactly what I’m talking about – if you didn’t puke it all out from the sheer richness, you would have felt quite ill after the meal. 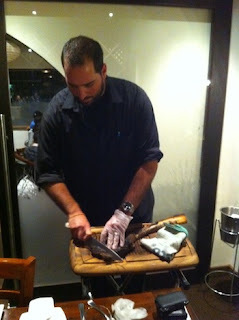 Restaurateur Daniel Gomer, the owner of Hippo Creek, will come out himself to carve up the tomahawk for you and you will see that this is a popular dish, because he’s had a bit of practice. So we come to the most important question: how are their steaks cooked? In my view, perfectly. My version of medium rare anyway – warm all the way through, yet still pink in the middle; delightfully tender flame-grilled meat that gives way with a gentle crunch as you bite in, and willingly yields its savoury juices and melts in your mouth as you chew. But it's holistically good (or "all good" as normal people say). The presentation on the plate is great, with the clever use of additional receptacles to keep different components from interfering with each other, and of course, to make it visually interesting. The service is also great. There's always someone on hand to take your order, top up your glass of wine or water, or offer to bring you something else. The other attraction about Hippo Creek is the fact that when you order steak, you will get an imposing Tramontina knife to carve up your meat. But what’s more, if you order a special cut of steak, your waiter will offer you a selection of sophisticated weapons, ranging from the French-made Laguiole, another French-made Nortron, and even a Shun Japanese steak knife made with 16 layers of Damascus steel on either side of the steel core, the multiple layering of the metal leaving a beautiful pattern of swirls upon the blade. I was lucky enough to try all of them in the one sitting, and I have to say that the Shun is easily my favourite, sliding through the meat like soft butter! 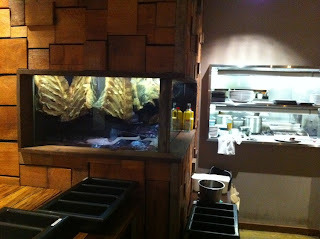 As if that wasn’t good enough, Hippo Creek also boasts a private dining room, which doubles as the reserve wine cellar. This room comfortably fits 10-15, although we have been known to squeeze in a few more, albeit with a tight fit. I have enjoyed many a lunch and dinner in that private dining room – the perfect venue for a long lunch with a group of mates or a birthday dinner for carnivorous friends!